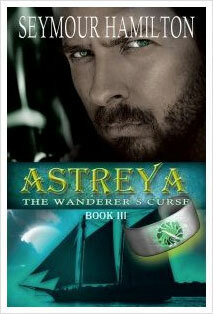 The Astreya Trilogy chronicles the adventures of Astreya, the son of a mysterious father he never knew. In search of his strange inheritance, Astreya is deceived, betrayed and cheated, but he also finds love and makes loyal friends who help him achieve his destiny. Astreya is a tale of the sea, a mystery and a love story. 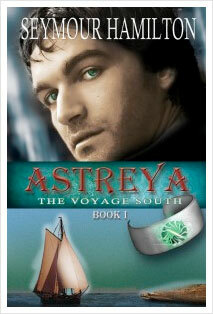 Download and hear Seymour Hamilton read Book I of The Astreya Trilogy, Astreya: The Voyage South. When Astreya turns 17, his widowed mother gives him his father’s knife, a riddling notebook and a bracelet with a mysterious green stone. He sails south, hoping to understand what his father’s gifts mean. He encounters a community murdered by men cursed to sail forever, is storm-struck, betrayed by a shipmate, abandoned by his skipper, and rescued only to be enslaved. His luck changes, and he travels to The Castle. He meets a painter, Gar, who is more than he seems, and his striking assistant, Lindey. Astreya is beginning to trust Gar and hoping that Lindey might share what he is feeling, when he discovers, too late, that Gar knew more about his father’s connnection with the men whose ships wander the ocean. Astreya respects Gar’s parting words and journeys to the sea with Lindey. 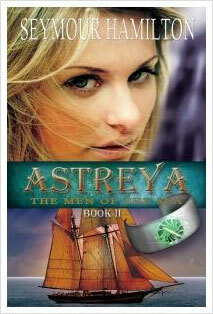 Just as they are about to declare their love, Astreya is kidnapped by the Men of the Sea. Aboard Cygnus, one of the great ships whose mission is to ‘shun land lest honour be lost,’ Astreya must learn how to wield the power of his stone from his grandfather, even as he yearns to return to Lindey, who is working ashore and wondering whether if they will ever meet again. Astreya’s grandfather wants to decide his future, a cousin schemes against him, an uncle wants him enslaved or dead. Who can he trust? People offer him knowledge and skills, only to turn against him or to die before they can tell him all he needs to know. As a consequence of two of these deaths, Astreya navigates Cygnus to find Lindey before his murderous, scheming uncle Mufrid does. A battle at sea ensues, involving death (real and apparent) and some revelations, more betrayals, and the need to repair damaged ships and restore Astreya and his friends to health. The book concludes with Lindey taking Astreya and his friends to Matris, the village she left to find her fortune. Book three begins with Astreya and his uncle Mufrid each thinking that the other is dead. Astreya and Lindey face immediate problems with their reception in Matris, where her grandmother’s benign rule has been usurped, and the community is under pressure from a power struggle that is aggravated the arrival of Astreya and his friends. The effects of Astreya’s past adventures in book one catch up with him, while at the same time Mufrid is rekindling his search for the navigation stones that Astreya can control and he can’t. His search takes him towards Astreya’s village in the great ship Cygnus, with Astreya trying to get there first to warn and protect the people where he grew up.